Find a method by which speed cameras can distinguish cars and their speed on individual basis. The client is large speed camera manufacturer. Because roads are getting busier, more cars will be driving at the same time along a speed camera. In order to determine whether a car drives too fast, the speed camera must be able to distinguish the different cars. The current speed cameras work in a different way: they only signal that ‘something’ passes through 2 measuring points. On the basis of the elapsed time between the passing of these 2 points, a speed camera calculates that a car drives too fast and therefore it flashes. When several cars pass these points almost at the same time, the speed camera can’t make the distinction that it concerns different cars. Therefore, the question was: find a method by which speed cameras can distinguish cars and their speed on individual basis. So that cars which too fast can be flashed for a speeding ticket. 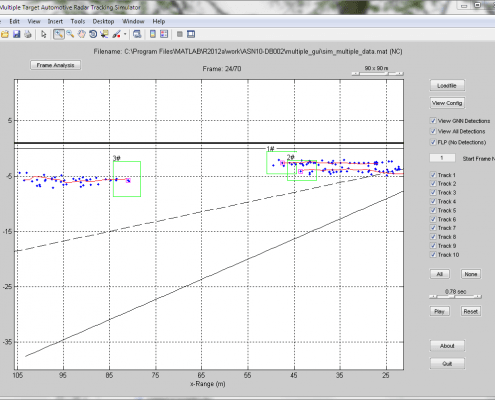 A demo of a typical automotive tracking application is shown below for a three car scenario. As seen, two cars are approaching from the right at different speeds (shown as #1 and #2) and a third car (on the other side of the road, shown as #3) is approaching the first two cars from the left. Notice that despite the tracking gates (shown as green/red rectangles) overlapping as all three car pass one another, the three tracks are clearly maintained, demonstrating the robustness of the data association algorithm. Result: cars which drive too fast can be flashed for a speeding ticket.